The Centennial was built in 1990 as a commercial trawler and seine fishing vessel and was subsequently modified to also participate in the longline and pot fisheries. The original engineering and design work was done by Jensen Maritime of Seattle, WA. The steel hull and aluminum house were computer lofted and plasma cut, and construction and equipment installation was done by Fred Wahl Marine Construction of Reedsport, Oregon. The conversion to a research vessel was done in 2002 at Hansen Boat Company in Everett, Washington. The vessel has a long history of safe and effective participation in a wide range of fisheries in the Gulf of Alaska. 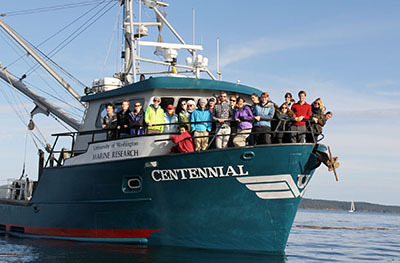 The R/V Centennial is well suited to meet the University’s research and education tasks. From 1990 to 2002, the vessel participated in numerous different fisheries in the Gulf of Alaska and the Pacific Coast and is configured with all the equipment and hydraulics necessary to support bottom and mid-water sampling devices (trawls, dredges, plankton nets, etc), water column sampling devices (CTD, Niskin bottles), acoustic sampling devices and deployment of a Remotely Operated Vehicle. Class field trips of short duration (< 36 total persons on board) can be comfortably supported. The vessel is also well suited for research cruises of longer duration with berthing and accommodations for parties of up to six. The vessel is 58’ in length, with a beam of 19’6” amidships. Cruising speed is 9 knots with a maximum speed of 10 knots with a full load of fuel and water, 6 people on board and up to 7,000 pounds of scientific equipment. The vessel is equipped with a trolling valve that allows speeds of less than 2 knots, and an American TRAC 16” single hydraulic bow thruster for slow speed directional control. A jog lever for the bow thruster is provided to the aft deck control station to allow for a full range of options for holding station while on the master is on the working deck. Power is provided by a single Cummins KT19, 425 continuous HP, single screw, diesel engine. This engine is one of the most popular engines Cummins currently manufactures and the Centennial’s engine has been upgraded to current model technology (including offset pin pistons and rotator valves in the heads). At cruising speed, 1575 rpm, this engine burns on average 10 gallons per hour. The propulsion system includes all necessary equipment and gages for main engine (located in both pilothouse and engine room). The system also includes a 24 volt electric system, and emergency shut downs. The engine uses integral keel cooling for heat exchange. All three engines on the vessel (main and two auxiliary generators) are dry exhaust with mufflers. Both auxiliaries (see below) are on soft mounts for reduced vibration. Additional sound deadening has been added to the flooring in the dry lab. The hydraulic system is a Bevis air clutch off the front of the main engine. This PTO drives two pumps: one two stage and one single stage that combine for 140 gpm at 2000 psi. The combination of hydraulic pumps is more than adequate for running both trawl winches, net reel and 2-boom system on board. There is also a backup hydraulic system that is run by a Pitts electric clutch off the back end of the larger auxiliary. This is a single two stage pump and is sufficient for running the winches on the boom system. In the event of a failure of the main system, it would be possible to retrieve the gear once. The auxiliary system is mainly used when hydraulic power is needed while under way when it is not practical to use the main hydraulics, or when loading gear and equipment in port to save fuel from running the main. The aft working deck of 610 square feet. This area includes hatches flush to the deck for access to lazarette, storage voids, and two aft storage holds. There is a 12’ long weather wall (with windows) on the port side extending aft from behind the house, and a 4’ long fixed roof extension running the full length of the weather wall. An outside wet workspace is directly adjacent to the deckhouse and underneath the roof. A 15’ long by 25” wide stainless steel counter in this space is equipped with double sink and water supply (fresh and salt). This wet lab space has power outlets, overhead lighting, a window on the port side, and is protected from the weather on two sides. The wet lab roof is accessed form the main deck and serves as a viewing and seating area with benches for 16 passengers. The vessel has a 2-boom system including a 4″ diameter steel picking boom on the starboard side and a center mount 8″ steel main boom. Both of these booms are controlled with independent hydraulic vang and topping fall systems. The starboard side picking boom has a Pullmaster PL 4 (lifting capacity 4000 lb.) under slung main wire winch and the main boom has a Pullmaster H8 (lifting capacity 8000 lb.) under slung main wire run through a hydraulically movable trolley system. This trolley system takes the place of an A-frame and allows for lifts over most of the working deck. The main boom also includes a 3′ cross piece on the end with additional pad eyes, and a backup to the main wire run through a second boom mounted PL4 winch. A Marine hydrowire winch with levelwind and 800 m of Amagraph .322 conducting cable can be used with equipment needing to be controlled or monitored from shipboard. This hydrowinch is used in conjunction with our oceanographic carousel consisting of 12 Niskin bottles and a CTD (Seacat 19, with added dissolved oxygen and fluorescence sensors), and could be modified for use with opening-closing plankton nets. Lifting capacity: 3000 lb. An electric (220 VAC) continuous wash down pump that is rated at 100 gpm (Flowmax 5) can be run on main or secondary auxiliary power. The pump is plumbed to the main deck with valving to select water flow. The suction is run from the main sea chest amidships. There is also a suction manifold on this pump that allows it to be used as an emergency bilge pump for any compartment in the vessel. The pump has a pressure relief valve. The vessel has two Dugas trawl winches, both with level winds and 300 fathoms of 3/8” wire rope. Mounting bases with stainless steel threaded bolt holes are welded to the decks at port, starboard and center positions. A through hull instrument well (0.38 m diameter) is located on the port side of the aft working deck area. When transducers are not installed through this well, a steel blank plug provides a nearly smooth hull surface. The vessel also has two hull transducer blisters with ample room for additional transducers. 160 square feet of interior dry (and electronics) lab has sinks, counters, cabinets, water supply and power hookups. This space includes an area set aside for ROV control and telemetry and a 50” flat, high definition plasma screen for viewing images from the ROV or video microscopes. A saltwater sampling system is plumbed to the sinks in both the wet and dry labs. The intake for this high quality water system is just below the waterline at the bow. The bridge is an enclosed aluminum pilothouse above main deck level with 360 degree visibility via aluminum framed safety glass windows. The Centennial can also be controlled from an aft station near the back deck hydraulic controls (steering, throttle, and bow thruster controls). A echo sounder and video monitor are visible from this station. Bridge electronics are listed below. The vessel has a removable stern bulwarks section with a built in three sided stainless steel stern roller with less than 30 cm gap. When this stern section is removed the opening is > 4 feet. Dredges, trawls or other sampling geat can be deployed over or through this opening. There is also an aluminum dive ladder to deploy or retrieve SCUBA divers. Fuel capacity is 3600 gallons distributed in four tanks; two wing tanks at 1400 gallons apiece, one day tank at 300 gallons and a bow tank that holds 500 gallons. All tanks are valved and plumbed to burn from and return fuel to any of the four tanks. There is a 25 gpm fuel transfer pump to move fuel for different trim conditions. Fuel capacity is sufficient for 24 hour operations for up to six full days of combined cruising and station keeping. All fuel runs through a dual Racor filtering system (water separators). There are foundations for deck checkers with threaded stainless sockets. When not in use, stainless sockets are capped with nylon socket head cap screws. Mounting pads for the deck winch, trawl winch, trap brailer system, and deck checker foundations give many tie down spots. The bulwarks around the aft work deck are 37.5 inches high. The vessel has multiple cleats and crab rails for mooring and tie down. The scupper system is in excess of IMO standards for a vessel of this size. 12 volt bilge pump rated at 35 gallons per minute (discharge via port side). 110 volt Flowmax 5 wash-down pump rated at 100 gallons per minute (discharge via deck hose). 220 volt Carver crab pump rated at 300 gallons per minute. This pump is a circulation pump for the fish holds that is plumbed for emergency dewatering. The pump and electric motor are new. 220 volt Carver crab pump rated at 750 gallons per minute. This pump is a circulation pump for the fish holds that is plumbed for emergency dewatering in extreme conditions. The small bilge pump runs off the 12 volt system and all other pumps are run by gensets. The smaller generator is capable of running the largest crab pump so there is a complete backup power source for all pumps. As currently configured, the steel forecastle enclosed deckhouse cabin is entered via an aluminum watertight door port side aft. Stepping down two steps into the cabin, the head is to the port and ahead the stairs and entrance into the engine room. Walking through the galley-dry lab area, is the forecastle which contains 5-berths and overhead escape watertight hatch. The hull below the waterline has welded zincs for corrosion. The vessel has two features that minimize wear on the exterior of the hull. From approximately 12’ forward of the stern there are removable 2”x 4”x 3’ UHMW trawl armor strips running vertically to provide protection from the trawl doors hitting the stern. These strips wrap around the stern on both corners and run forward. There is also a large (approximately 12’) UHMW sheet covering the starboard side from the cap rail to the rub rail that was originally put in place to prevent pots from damaging the paint. This also provides excellent protection and a softer impact point for launching ROV or other equipment from the starboard side. The vessel has a fo’c’sle with 5 comfortable berths (with privacy curtains) and storage. One additional berth is located in the pilot house. The fo’c’sle is equipped with a watertight Freeman escape hatch. (The laboratory, pilothouse and berthing area all have at least two ways for escape.) All interior hull spaces are sprayed with fire retardant foam. The vessel is quiet by industry standards and additional sound insulation has been added to the lab floor. Lighting for the interior spaces is 110 VAC with back-up emergency lighting from the 12 volt system. Heating is supplied by electric 110 VAC heaters. The head has a freshwater sink, large shower, a Kenmore stackable clothes washer and dryer and a Wilcox marine toilet. The painted aluminum pilothouse is above the dry lab space and is entered via internal steps from the lab or from the outside through an aluminum watertight door on starboard side aft. Inside is a full width dash and counter top (> 13’) with main console on starboard side. All electronics are be mounted in, on and overhead of the main console. Along the aft wall of the pilothouse is a day berth with storage below for 6 survival suits, drawers, and cupboards for additional storage. Visibility is 360 degrees via aluminum framed safety glass windows. Window defogging devices are provided. Interior finish is Formica, carpet, paneling and wood trim. The fisheries that the vessel has participated in require sight and voice communication between the back deck and the pilot house and the vessel is well laid out to facilitate this. There are two ergonomic captains chairs in the pilot house and the day bunk provides seating for an additional four people. The forward counter space has storage underneath for charts and there is ample storage in drawers for owners manuals, operations manuals and log books. There are two wire ways from the pilot house to the lab space with one running all the way to the engine. The vessel includes a closed circuit video system with a monitors in the pilot house and dry lab (visible to the back deck control station). Four cameras are placed to reproduce the view from the pilot house and additional video cameras are placed in the engine room, both labs, working deck, and well deck areas. Vessel is also equipped with rechargeable emergency lights at both life rafts, a signal halyard and approved sound signaling device. Furuno FS1501 SSB radio with auto coupler. Standard communication Intrepid VHF, including a Standard Comm CMP23 remote microphone. This radio includes a full function, waterproof, remote microphone that also acts as an intercom. This system gives a total of three separate locations with VHF communication. Furuno FR7100D, 72 mile, 10 KW radar. This 10KW, 72 mile unit. Furuno 1730 24 mile radar. One Alden G-PIRB with built in GPS signal that broadcasts vessel’s location (in latitude/longitude) along with distress signal. One Furuno (Lakata) EPIRB. This unit is a conventional EPIRB with no GPS signal included in its broadcast. Furuno FCV 271 1000 watt color sounder with 50 khz transducer. Bridge and dry lab computers are Windows based PC’s. The bridge computer interfaces with the GPS for ship’s navigation (ChartView) and trip logging. The Dry lab computer interfaces with the GPS, acoustic devices and the ROV (using TrackPoint II hardware and Hypack software). The dry lab computer is equipped with a wireless internet connection (dockside) and a color printer. Furuno LP 1000 12 vlt GPS plotter. This is a full back-up system in the event main navigation computer is off-line. It has its own GPS receiver. The vessel’s electric system has proven extremely safe and reliable. There is complete redundancy in all systems, 110 VAC, 12 volt, and 24 volt. This system redundancy provides complete backup to all power sources. In 12 years, there have been no indications of hull corrosion or extensive zinc use with this configuration. The vessel’s main engine has a 120 amp 12VDC alternator capable of providing power to all 12VDC systems on the vessel while keeping a full charge on the batteries. As a backup, there is a 30 amp 12VDC Lewco battery charger that is powered by either generator or shore power. Twelve volt power is generated by a 120 AMP, 12 volt alternator that is belt driven off the main engine. Power runs through 2 banks (four 8 D batteries total). Backup power is from a Lewco 30 amp, 12 volt constavolt. Twenty-four volt power is used to start the main engine and power the 10KW radar. Power is generated by a 60 amp, 24 volt alternator that is belt driven off the main engine. This power runs through a single bank of batteries (two 8 D). Backup power is from a Lewco 30 amp, 24 VAC constavolt. John Deere 4039 DFM W/ Lima 40 KW 3 phase AC generator. Yanmar 4JH2L-HT 25 kw 3 phase generator. The vessel’s hydraulic system includes a primary system run off the main engine and a back-up system run off the #1 auxiliary. This system is designed with versatility in mind. It accommodates 4 different gear types and to allow change over in gear with a minimum of effort and mess. The oil output of the main system (140 gpm @ 2000 psi) is more than enough to run all systems on board easily. Main engine front end Bevis air clutch driving a Vickers 2 stage 60/40 pump and a Vickers single stage 38 pump. For total output of 140 @ 1200 rpms. Oil reservoir is 300 gallons. Cooling for the hydraulics is provided through a large capacity tank (below water line) that is integrated with the bottom and side of the hull. Driven off back end of #1 auxiliary by drive shaft through Pitts electrical clutch is a Vickers 2 -stage 18/25 pump. This is a back-up system that can supply oil to all hydraulic equipment on the vessel. This system is more than adequate to run the boom system, single winch, and anchor windless. It could retrieve the trawl gear in an emergency (like main system failure) but is not large enough to effectively run a trawl operation. This back-up system saves wear and tear on the main engine, avoiding long hours at idle when loading and unloading gear at the dock. This system also facilitates use of hydraulics while underway. There is no need to slow down to engage the power take off. Vessel has hydraulic anchor winch with a 300 lb. Danforth style anchor, 15 fathoms of 3/4 “ chain and 75 fathoms of 1/2” steel cable. The vessel has anchored in depths up to 30 fathoms routinely. The Centennial has two 670 gallon water tanks for a total of 1340 gallons. Tanks feed a 12 volt 4.5 gpm pump that supplies a pressurized system that includes the sinks, shower and washing machine. separate emergency 12 volt power source wired to 12 volt panel in wheel house. This system gives an emergency power source in the event of a fire or flooding in the engine room. One pair Poly Ice 3.2 meter trawl doors and one pair of Fishbuster trawl doors. A Deep Ocean Engineering Phantom II ROV is available for deployment from the Centennial. Video feed emanates from a high resolution color video camera and can be displayed on the large plasma screen in the dry lab. Depth limit of the ROV is 1100’, but practical limits (about 500 ‘) are actually set by the 1200’ of umbilical cable. Three high power lights illuminate the video and a laser pointer system places a reference index (10 cm) on the picture. Video can be recorded through a digital camcorder with voice-over if desired. The system is augmented with telemetry provided by a transponder on the ROV, a hydrophone mounted through the hull well of the Centennial, TrackPoint II hardware, and Hypack software. The GPS position of the ROV can be tracked and its Latitude and longitude (with time and date) can be superimposed on the recorded video. For all costs, researchers and scholars should refer to our Researcher and Scholar Rates or, if paying expenses directly from a University of Washington budget, our UW Budget Researcher Rates. 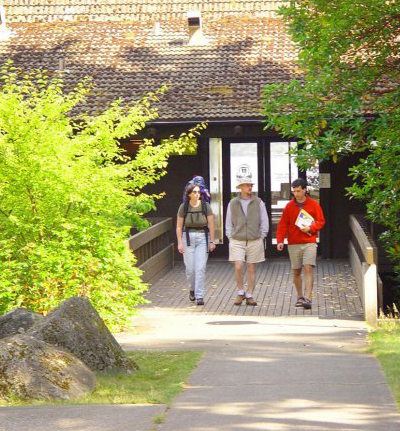 Visiting groups should refer to our section on Conferences and Field Trips for information on group costs. Students enrolled in FHL courses or research apprenticeships can find information on Course Costs in the Course section.